STACK TRI LAYERS into cmo name cmo1. Read 4 AVS triangulated surfaces into 3 materials. Stack and pinchout if layers cross. Label material colors with 1 on bottom and 3 on top. 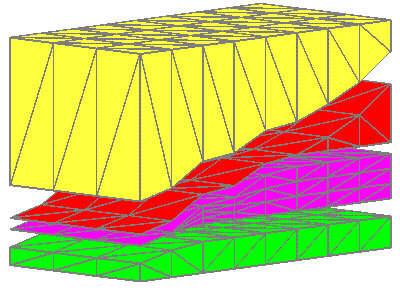 The following commands convert the stacked 2D layers into 3D volumes. In this example, triangles are stacked into prism elements. Each of the prism elements are then converted into 6 tet elements. The command boundary components will check for 1 single boundary. 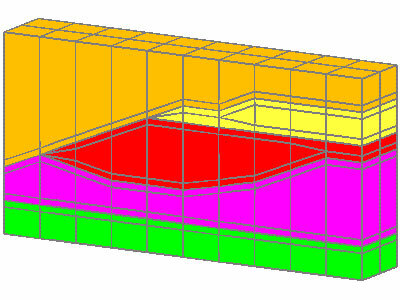 1 different boundary components identified. Stack/layers with material colors reversed. Material 1 (green) is now the top unit. 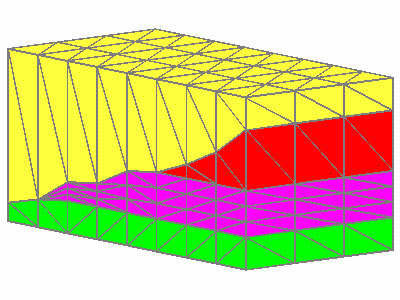 Material 2 (purple) is middle and 1 (red) is bottom. Stack quad layers and fill with hex elements, with buffered interfaces. Read 6 AVS quad surfaces into 5 material units. Label unit colors with 1 on bottom and 5 on top. Stack and pinchout if layers are closer than .19 meters. Add a buffer layer .2 meters above and below each interface. Truncate by 5th file to read. Note the & character added so command line is not too long to read. tri layer to prism then to tet with truncating surface and layer refinement. STACK TRI LAYERS into cmo named cmo1. Read 5 AVS triangulated surfaces into 4 material units. Label unit colors with 1 on bottom and 3 on top. Stack and pinchout if layers cross. Add two layers for refinement in second unit. truncate 4 / pinch 0.